In a storied history spanning four centuries, Boston Common has played host to grazing cows, a military encampment, victory gardens, and a bandstand modeled after a Greek temple. 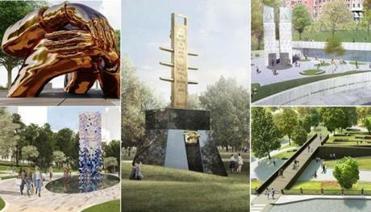 Soon, the iconic park could feature one of its most dramatic additions: a large, visually striking memorial to the Rev. Martin Luther King Jr. and his wife, Coretta Scott King. Five designs selected by a committee of city officials, artists, and academics will be unveiled Tuesday, giving the public a chance to comment on the proposals before the panel picks the winner in November. Each, in its own way, would significantly shift the look and feel of part of America’s oldest public park, founded in 1634, and would cap the long debate over how to best honor the Kings’ legacy in the city where they met. The proposals include a black stone bridge that crosses from Beacon Street by the State House over a large Common walking path; a 22-foot sculpture of the Kings’ interlocking arms made of mirror-finish bronze; an “avenue of peace” with a 30-foot fountain of colorful mosaic rising from a 120-foot-long oval pool; a reflective, glass-walled walkway leading to two “beacon towers” that emit light and sound; and a stone-and-bronze sculpture inspired by King’s pulpit that would be topped with a searchlight. Which MLK memorial do you want to see on Boston Common? A new memorial for Martin Luther King Jr. and Coretta Scott King could be erected on Boston Common. See how Globe readers voted in a non-scientific online poll. Read: Perspective: Can the MLK memorial change perceptions about Boston? The plans will be available for public comment online and at the Boston Public Library in Copley Square and the Bolling building in Dudley Square until Oct. 16. City officials and members of Martin Luther King Boston, the private nonprofit group that is spearheading the memorial, will announce the winner. Plans call for the memorial to be completed in late 2019 or early 2020. Paul English, a software entrepreneur who is founder and co-chairman of Martin Luther King Boston, said the five designs exceeded his expectations. He acknowledged, however, that some may not be happy that the designs are larger and more contemporary than the park’s assortment of stone fountains and weathered memorials, many of which date to the 19th century. Elizabeth Vizza, executive director of Friends of the Public Garden, said the King memorial would be the largest addition to the Common since four entrances to the underground garage were built in the 1960s. She declined to comment on the five final designs, saying she had only seen them briefly. She noted that the Common is undergoing a $23 million master plan to upgrade its paths and amenities. “We look forward to seeing how the final choice will evolve in a way that serves the vision of the memorial and the park,” said Vizza, whose organization seeks to preserve and enhance the Common, Public Garden, and Commonwealth Avenue Mall. The five finalists were selected from 126 initial submissions. Four would be built on symbolically resonant terrain adjacent to the Robert Gould Shaw and Massachusetts 54th Regiment Memorial on Beacon Street, which commemorates a unit of black soldiers who fought in the Civil War. The sculpture inspired by King’s pulpit would be built not far from that, near the Parkman Bandstand. The memorial will cost $5 million, all from private donors; $3 million has been raised so far. The city envisions the project as a way to elevate the Kings’ stature in the city where they met and fell in love. Martin Luther King spent several formative years as a doctoral student at Boston University’s School of Theology in the 1950s and preached at Twelfth Baptist Church in Roxbury. Coretta Scott studied at the New England Conservatory of Music. “I think he’s one of the most important Bostonians we’ve had in 50 years, and we should celebrate that,” said English, who founded the companies Kayak and Lola. While the competition between the five designs is just beginning, some are already garnering buzz and a few quizzical comments. The mirrored-bronze interlocking arms, by Hank Willis Thomas, a Brooklyn-based conceptual artist, working with the MASS Design Group, might be the most daring of the group, said Barry Gaither, director and curator of the Museum of the National Center of Afro-American Artists, and co-chairman of the committee that selected the finalists. Visitors would be able to walk under and around the sculpture, titled “The Embrace,” which was designed to honor King’s focus on the power of love and collective action. “It’s exceedingly bold in its combination of both the sensual and the dramatic,” Gaither said. It might also be highly instagrammable. The “Empty Pulpit” sculpture by the writer and sculptor Barbara Chase-Riboud is perhaps the “most traditional and, in a certain sense, the most challenging to embrace and decipher,” Gaither said. “But it’s really very good to have a sculptor of her international standing” in the competition. The “Avenue of Peace” by Yinka Shonibare, a British artist of Nigerian descent, and Stephen Stimson Associates Landscape Architects would include 22 inscribed stone benches. It “toys with the idea of walking, and how important walking and marching is” in King’s legacy, Gaither said. The two “beacon towers” that emit light and sound are part of a sprawling proposal by the Cambridge-based firms Wodiczko + Bonder and Maryann Thompson Architects, working with Walter Hood, the founder of a California designer firm. Emanating from the towers would be ripples in the ground, evoking the “ripple effect” of the Kings’ moral leadership. Leading to the towers would be a reflective, glass-walled walkway tucked below an overhang and inscribed with a chronology of civil rights milestones. The black stone bridge is a collaboration between several artists and design firms: Adam Pendleton, Adjaye Associates, David Reinfurt, Future\Pace, and Gilbane Boston. By providing visitors with a vista overlooking the Common, it is designed to evoke King’s “I’ve been to the mountaintop” speech, which he delivered one day before he was killed in Memphis in April 1968. Correction: Due to incomplete information supplied to the Globe, a previous version of this story did not include all the contributors to the “Avenue of Peace” proposal. Perspective: Can the MLK memorial change perceptions about Boston? Levenson can be reached at michael. levenson@globe.com.